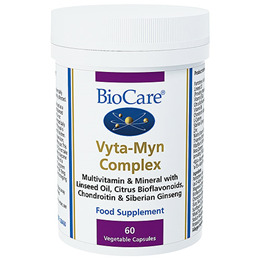 VytaMyn Complex is an ideal vitamin and mineral supplement for the pressures of day-to-day life. Zinc is an antioxidant nutrient required for the health of the immune system. Pantothenic Acid (as Calcium Pantothenate), Capsule Shell (hypromellose), Vitamin E (as D-Alpha Tocopheryl Acetate), Modified Tapioca Starch,, Anti-caking Agents (Silicon Dioxide & Vegetable Magnesium Stearate), Zinc Citrate, Linseed Oil, Potato Maltodextrin, Magnesium Citrate, Citrus Bioflavonoids (Citrus sinesis), L-Cysteine Hydrochloride, Vitamin B6 (as Pyridoxine Hydrochloride), Chondroitin Sulphate,, Siberian Ginseng (Eleutherococcus senticosus), Alginate, Soy Protein, Acacia gum, Niacin (as Nicotinamide), Thiamine (as Thiamine Hydrochloride),, Beta Carotene, Riboflavin, Sunflower Oil, Biotin, Manganese Citrate, Antioxidants (Ascorbic Acid, Ascorbyl Palmitate & Natural Mixed Tocopherols), Chromium Picolinate,, Vitamin A (as Retinyl Palmitate), Sucrose, Folic Acid, Sodium Molybdate, Copper Citrate, Vitamin K (as Phylloquinone), Corn Starch,, Sodium Selenite, Potassium Iodide, Vitamin B12 (as Hydroxycobalamine), D-Alpha Tocopherol, Vitamin D (as Ergocalciferol). If you are taking anti-coagulants (blood thinners) do not take this product except on the advice of a doctor. Not suitable for individuals suffering from thrombosis. 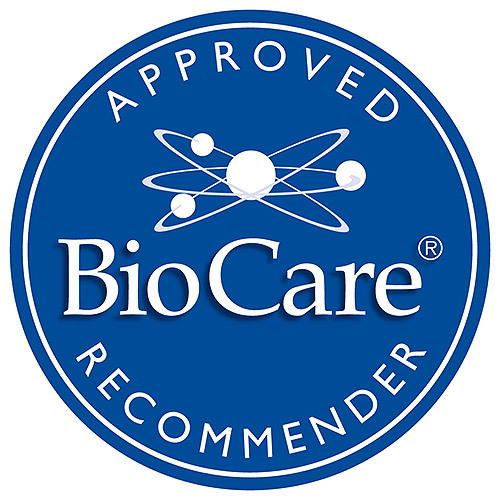 Below are reviews of VytaMyn Complex - Multi Vitamin - 60 Vegicaps by bodykind customers. If you have tried this product we'd love to hear what you think so please leave a review.